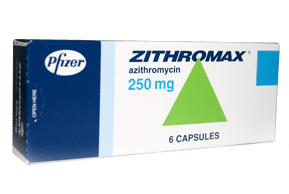 Zithromax is the brand name for the generic drug Azithromycin and is an antibiotic available by prescription only. Zithromax belongs to the macolide antibiotic group of drugs. Zithromax is effective for fighting infections in the body. This medication is not effective for viruses. Zithromax is available in tablet and immediate-release liquid forms. It may be taken as a single 1g or 2g formula, or in doses of 250mg or 500mg. Dosing recommendations will vary according to the ailment you are treating. As with any antibiotic, you should always complete the entire regimen as directed, even if your symptoms go away. Zithromax (azithromycin) is used to treat a wide variety of infections including respiratory infections, sinus infections, throat infections, ear infections and skin infections. It may also be used to treat certain sexually transmitted diseases such as Chlamydia, gonorrhea and chancroid. In some instances, a doctor may prescribe azithromycin for off-label uses. Off-label uses for Zithromax may include the treatment of whooping cough, acne and cat scratch disease. Doxycycline is a generic form of a tetracycline antibiotic medication. It is marketed under several brand names such as Oracea, Adoxa, Atridox and Vibramycin. Minocycline is the most water-soluble of all the tetracycline antibiotics and is commonly used to treat skin conditions and infections. It is also marketed under the brands names Dynacin and Minocin. Flagyl is a brand name for the generic drug metronidazole and is a prescription-only antibiotic medication. It belongs to the nitroimidazole class of medications.